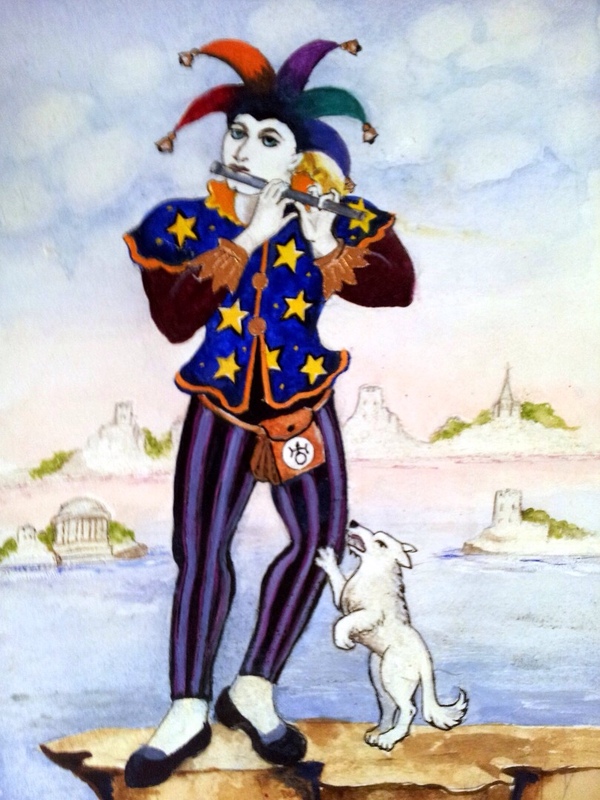 The Fool card of the Rider-Waite Tarot* deck was always my favorite of the Major Arcana. The main figure is androgenous, has a devil-may-care attitude, and seems to be jauntily stepping off a cliff in spite of the little dog’s warning! (or is the dog chasing them off the cliff?) I love the Fool’s joyful and open-hearted posture while moving onward and upward into a literal leap of faith depicted on the card. Being a fool was frowned upon in the circles in which I was raised. There was a strong sense of a right and a wrong way to do things, and one must always know what one is doing. I thought the adults around me knew what was going on and had it together. Uncovering that mythology is what growing up is all about! Now I understand and I forgive. We are all doing the best we can. So the time has come to embrace My Fool. The part of me that is open to discovering a world of sound and vibrations. The part of me that is excited to share that with others. The part of me that is sad when so few engage with my work. The part of me that is going to do this anyway, whether anyone listens or not. The part of me that is like a “mad scientist” listening, thinking, creating, listening, shifting sonic shapes, listening some more. The part of me that trusts the process. The part of me that can wait and respond from the center of my being. Being on the edge and comfortable is the message of these cards. I mentioned the leap of faith the Rider-Waite Fool seems to be taking! The viewer of the image can’t see where The Fool’s left foot is going, and it seems it might go nowhere…but The Fool is now here. What appears to be a leap of faith may just be the next step!